Two of the things most often associated with ESP-Disk' are free jazz and balls-to-the-wall saxophone improvisations. Go with your strengths, people say, so for our first physical release in our 50th anniversary year, we present producer Michael D. Anderson's compilation Fire Music. The saxophonists on these tracks are Albert Ayler, Charles Tyler, Frank Wright, Arthur Jones, Jack Graham, Byard Lancaster, Joe Phillips, John Tchicai, Marshall Allen (twice), Gato Barbieri, Sonny Simmons, Pat Patrick, and John Gilmore. Obviously we're not just going with the obvious choices, because ESP-Disk' is not that kind of label. Thrill to the sounds of saxophone legends so obscure, they're almost mythical – alongside, of course, giants such as Ayler, Wright, Barbieri, and Sun Ra's trio of decades-faithful sax masters. 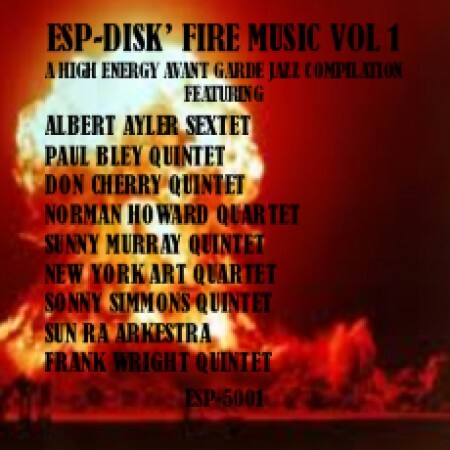 Albert Ayler, Donald Ayler, Paul Bley, Don Cherry, Frank Wright, Sunny Murray, Alan Silva, Norman Howard, Roswell Rudd, John Tchicai, Gato Barbieri, Sunny Simmons, Marshall Allen, Sun Ra and more! Musicians: Albert Ayler / Donald Ayler / Paul Bley / Don Cherry / Frank Wright / Sunny Murray / Alan Silva / Norman Howard / Roswell Rudd / John Tchicai / Gato Barbieri / Sunny Simmons / Marshall Allen / Sun Ra and more!